LYA | What Does LYA Mean? LYA means "Love You Always". The abbreviation LYA is used with the meaning "Love You Always" as a way of saying you will always love someone, regardless of anything else that may happen. It is typically used when closing a conversation with a loved one, but is also sometimes used at the end of messages between close friends. "Love You Always" can also be abbrieviated as LUA. The abbreviation LYA is sometimes also used with the meaning "Leave You Alone". In this context, LYA is used to indicate that you are going to stop texting or talking to someone for a while (maybe because of an argument). LYA means this love is forever. Chantelle:Will you love me forever? Ryan:Of course I will. I'll LYA. Karen:I've done all your washing and cooked a meal. 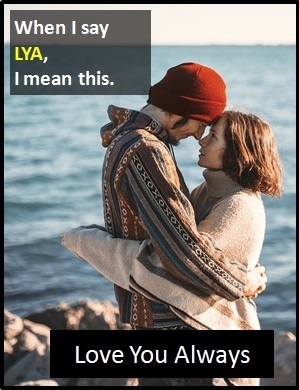 Whether used with the meaning "Love You Always" or "Leave You Alone", the abbreviation LYA is typically used as a standalone declarative sentence (i.e., a statement). In other words, it is not often used as another part of speech within a wider sentence. Before the digital era, we might have said something like "I'll always love you" or "I will love you forever" instead of using LYA.